Khejur Gur (liquid date palm jaggery -- made from boiling the sap from date palms) is very popular in Bengal during the winter months. It is also commonly called "Notun Gur" ( literally, "new jaggery") or "Nolen Gur". During the cold season from December to February, the sap of the date palms is best harvested and that is the reason we get this gur or jaggery around this time. If you are in rural Bengal during the winter months, and you happen to stroll across the damp fields on a foggy morning, you will see palm trees with a afro-top hair rising like sentinels across the mist. And if you hear closely, you will hear the tip-tip of the sweet sap dripping into the earthen pots hanging just below the palm fronds. The night before, tappers have scaled the thorny trunk of the tree, to tie those pots there. That sap is pure nectar and when boiled for hours over a wooden fire, it changes color and form to shape into our favorite Nolen Gur or Khejur Gur -- a jaggery synonymous with every Bengali's winter. The liquid Khejur Gur is delicious, tastes better than Maple Syrup and we used to have it poured on our Luchi (Puri) or Roti for dinner or breakfast. In solid form it is sold in the shape of oval discs and is also known as "Patali Gur" or "Notun Gur". This new jaggery harvested only in the winter months is used to make a variety of sweets in Bengal like "notun gur er sondesh" or "khejur gur er roshogolla". Ahh, the nolen gur er sondesh is so divine that if you taste it even once, the memory lingers on your tongue forever. Some of the most popular ones being Gokul Pithe, Khejur Gur er Paayesh, and Pati Shapta. 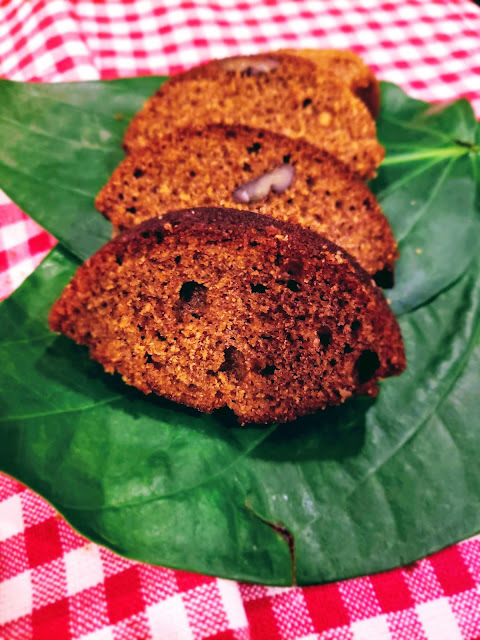 Now since I was not too keen on making any of the above, this year I decided to celebrate sankranti with Nolen Gur er Cake. It has Khejur Gur plus coconut, that is 75% of Sankranti requirements being met. So, why not, new traditions? 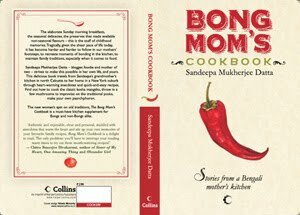 The cake recipe comes from my friend Moumita (of the Kochu Paata Chingri fame), who had made this last month. Her cake was fantastic and we had devoured it in no time. I took her recipe and added my little nuances which is my habit. However, her cake had more of the Date Palm jaggery flavor. 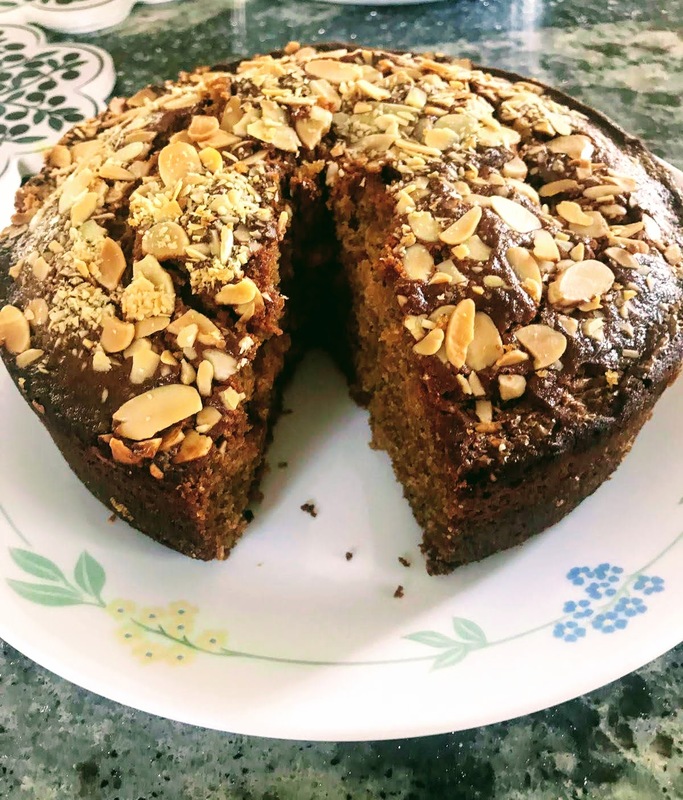 In my recipe, I also added some dates, which made the cake very fluffy and moist but the dates kind of masked the delicate flavor of the Date Palm jaggery.